The radicalization of mentalities, political and social changes and situations of crisis can turn peaceful coexistence into a situation marked by extreme violence. From the 14th century onwards the Jewish communities were often attacked, marginalized or accused of various crimes and acts of sacrilege. At the end of the fifteenth century, the Jew's conversion edict poured many families into exile. 1394, Majorca. Reproduction (original in the Archives of the Kigdom of Majorca). The breakdown in relations between the communities and outbreaks of verbal, physical and legal conflicts increased steadily during the 14th century. By the end of it, the marginalization of the Jewish population was highlighted by repressive orders such as having to wear a round signal (called rodella) sewn in their clothes whenever they left the quarter. In the Kingdom of Majorca it had to be of two colours: "la meytat vermella e l'altra meytat groga" (one half red and the other half yellow). Rome, 1500. Arising from the numerous disputes and religious controversies that developed between Jews and Christians all over medieval Europe, various texts were published which attempted to refute the tenets of Judaism by referring back to its own sources. 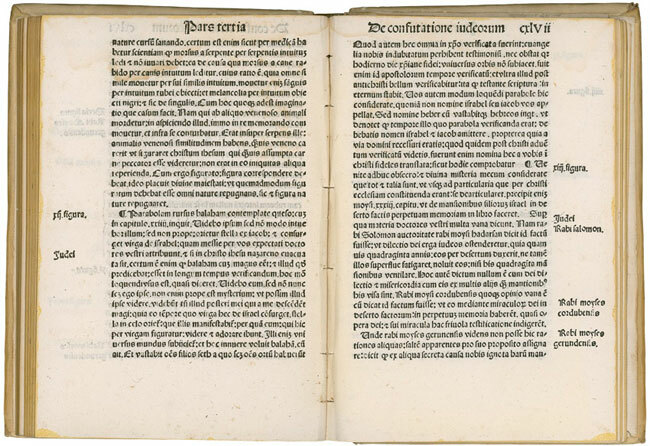 This volume, for example, which was published in Rome in 1500, contains a refutation of the thought of some of the leading medieval Jewish figures such as Maimonides (Moses Cordovensis) and Nahmanides (Moses Gerundensis). 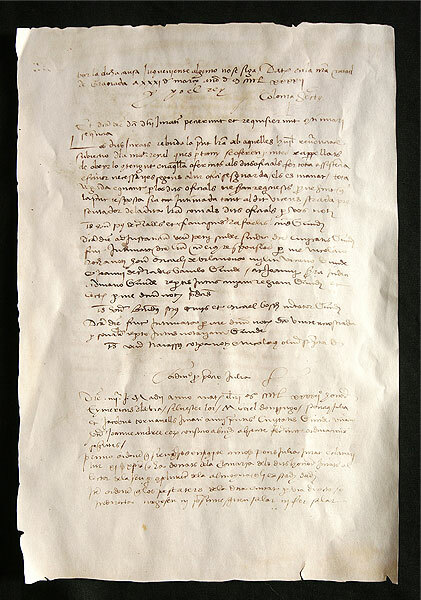 Manual of Agreements, April 20, 1492. 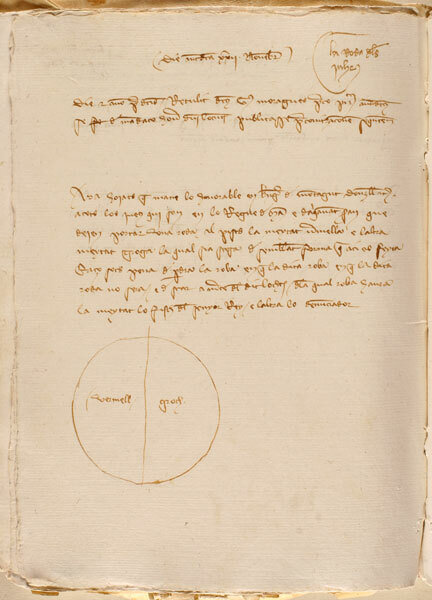 Reproduction (original in the Municipal Archives of Girona). 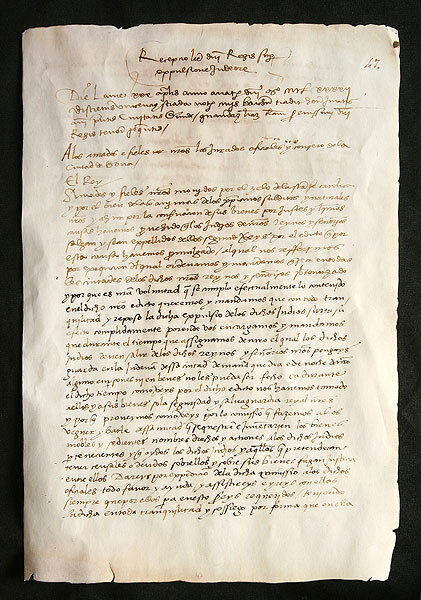 On April 20 1492, the Girona magistrates received notification from King, who dictated that before July 31 that same year, all Jews who refused to convert had to leave the city and never return. With this edict, copied in the Manual of Agreements, over six centuries of shared and fruitful history came to an end.